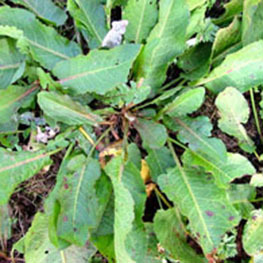 We use professional herbicides to control these weeds. They are significantly more effective than domestic garden products and can only be applied by qualified licensed spray technicians. There is no need to worry, we know what we are doing, we are trained to handle and apply products safely, complying with all legislation and are fully qualified and certificated. Your lawn is safe to use as soon as the grass is dry, usually within an hour or two. Flowers from May to June in dry lawns and from May into October in moist ones. The flowers are self-pollinated. Seeds ripen one month after flowering and can form a persistent seed-bank. Lawns can become densely infested. 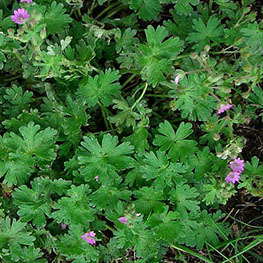 The plant develops creeping stems and can be spread by stem fragments carried on feet. After mowing, composting should destroy stem fragments in the clippings. 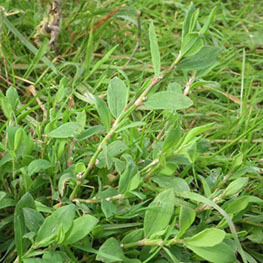 A common grassland weed. 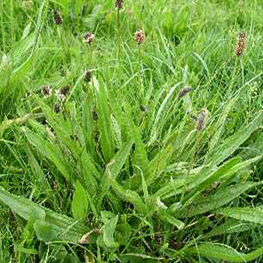 Not as widespread in lawns as the Greater Plantain. Most flowers develop in June and July and seeds develop 2 weeks after pollination. A perennial with a stout tap root that can live for 10 years or more. Flowers from May to October. Established plants can flower twice a year producing up to 12,000 seeds which germinate most profusely on uncultivated soil. Flowers from June to August and is insect pollinated. Seeds set from July producing up to 6,000 per plant. It has a well developed fibrous root system and prostrate stems that root at the nodes becoming far creeping stolons. 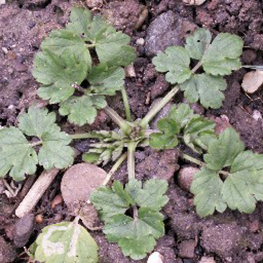 An annual weed that spreads quite rapidly by creeping stems. 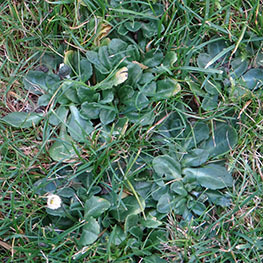 It can be a major problem on nutrient deficient lawns. 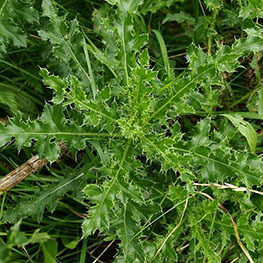 This can be a difficult weed to control and is resistant to most shop bought herbicides. Flowers from May to August and is insect pollinated but not all plants flower. Ripe seeds are highly dormant and unaffected by frost. 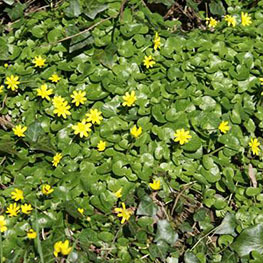 It has a creeping habit especially in wet weather when it sends out runners. An overwintering plant which flowers and sets seed throughout the year even under 20cm of snow producing 2500 seeds per plant which can remain viable for 25 years. The spreading stems may root at the nodes. A perennial flowering from May to August . 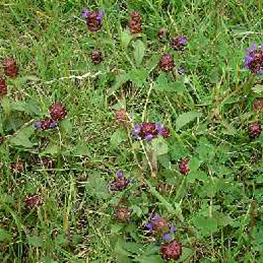 Common on neglected lawns. 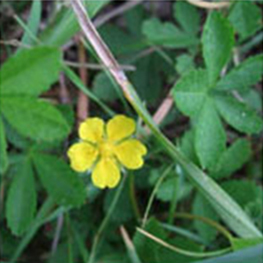 The same family as Creeping Cinquefoil but each leaf has 6 to 14 leaflets instead of 5. 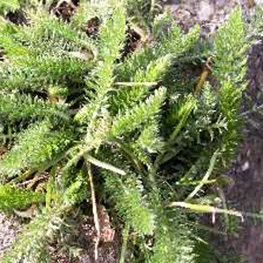 It spreads by creeping stems which root at nodes. 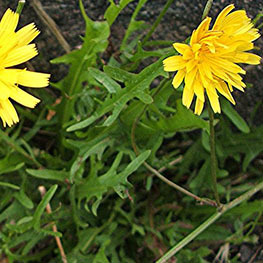 A dandelion type of weed that is both annual and biennial. Each leaf has whitish swollen pimples which are rough and bristly to touch. It flowers from June to September producing clusters of flowers up to 25mm in diameter. 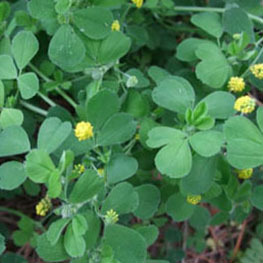 A perennial weed with yellow flowers which appear from June to October. 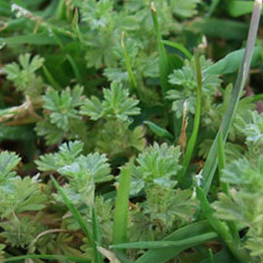 Common on neglected lawns and spreads by creeping stems which root at intervals. Each leaf has five leaflets with toothed edges like strawberries. 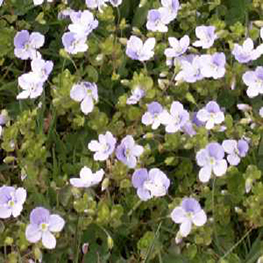 A perennial which on lawns is usually less of a problem than Slender Speedwell. 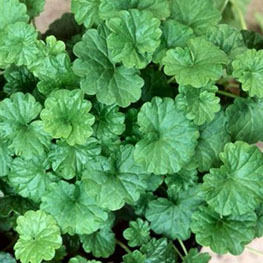 Spreads by underground and overground runners and is also known as Bird’s-eye Speedwell. Flowers April to June and prefers wet conditions. 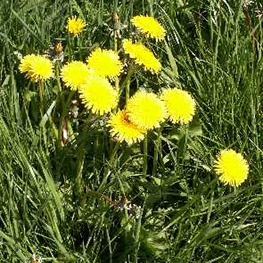 A very common weed in lawns. It has medicinal uses and used to be applied to wounds. Flowers from May to Sep and is wind pollinated. Each plant may produce 14,000 seeds. Smothers surrounding grass if allowed to grow. 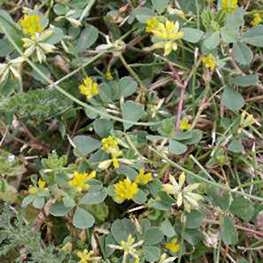 Clover flowers from June to Sep and is insect pollinated. Seeds are viable 12 days after flowering . 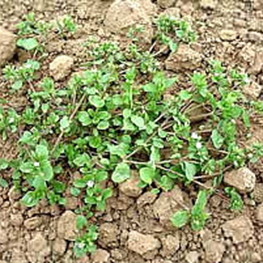 White Clover develops stolons up to 100cm long, Red Clover has a more tufted growth and forms a strong tap root. 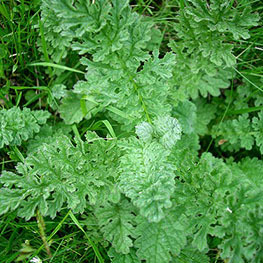 This can be an aggressive weed on lawns. It flowers from June to November and is insect pollinated. Seeds are shed from August to October. It overwinters as a rosette of leaves and new shoots develop iin late spring. 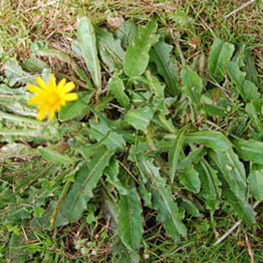 A rosette type weed with a strong tap root that is easily mistaken for a Dandelion but has narrower pointed and toothed leaves. It flowers from June to October and has a single flower with a pungent fragrance. 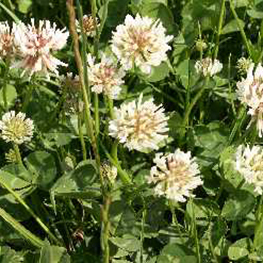 Member of the clover family, spreads by runners, over and under ground and forms a deep root system. Forms large patches if not treated. Flowers from April until Sep which are yellow often with a red streak. Looks like Lesser Trefoil and White Clover. It flowers from April to October and can be distinguished from other weeds by the pods which turn black when they are ripe. It prospers on neglected lawns. 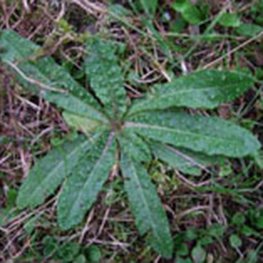 A perennial weed with a deep tap root. Seeds contain a chemical that inhibits decay and can survive for 50 years. Mowing has little effect on established plants but will inhibit seeding. Perennial of the buttercup family, flowers from April to July. It has a swollen corm-like stem below the surface which survives through the winter months. It grows in nutrient starved, well drained lawns. A dandelion type of plant with a deep tap root. It withstands close mowing. The leaves are fleshy, hairy and with teeth. 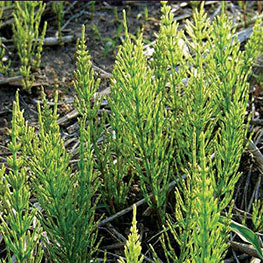 A plant can regenerate from a root fragment so control is by use of a selective herbicide. Poisonous to horses and some livestock. Specified in Ragwort Control Act 2003. Flowers June to Nov. If allowed to flower is a biennial, otherwise behaves as a perennial. A perennial of the dock family. Produces green flowers in May to Aug which turn red as they ripen. Male and female flowers occur on separate plants producing 2000 seeds per plant. A perennial, only a problem on newly sown lawns. Cannot tolerate regular mowing. Seeds are viable 8 to 10 days after flowering. The creeping root system can reach a depth of several metres. A perennial of the buttercup family. Also known as the Meadow Buttercup. 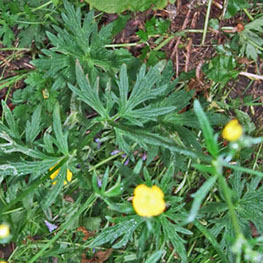 The rare Autumn Buttercup is often treated as a variety of this species. 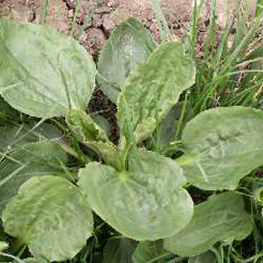 Toothed leaves with five lobes, flowers May to August. Very common in lawns. A perennial that spreads through underground runners. 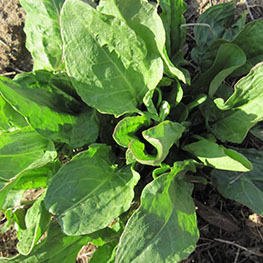 Leaves form a rosette and are slightly scalloped. They tolerate close mowing. 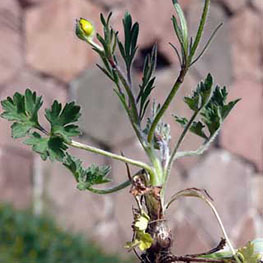 Flowering occurs from March to October. 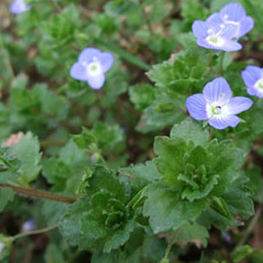 A perennial that looks similar to speedwell. It is a member of the mint family and has a minty odour. Spreads by creeping stems that root at the nodes. It produces funnel shaped bluish violet flowers in spring. 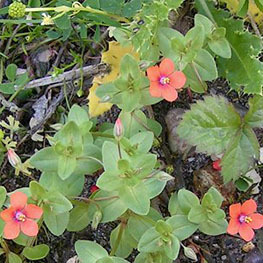 A perennial that spreads by underground runners that can be up to 2 metres deep. Leaves are needle like. It doesn’t flower as such but produces spores. Not usually a problem on lawns that are regularly mown. An annual not found on maintained lawns. Pink flowers are produced from May to Oct and are self pollinated. Seeds are produced from July onwards and are ripe within 60 days after maturing. Lance shaped leaves. 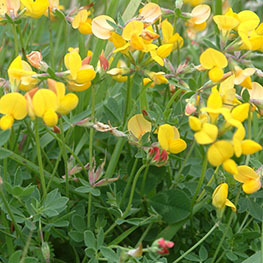 A perennial of the buttercup family and flowers from February to May, favours shaded areas. Self or insect pollinated, the seeds shed in June. Medicinal uses include the treatment of piles. 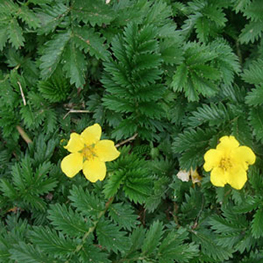 A perennial that spreads quickly forming a dense mat and can tolerate close mowing. Hairy fleshy leaves that are oval in shape. Flowers appear May to Oct and are white with five petals with deep lobes. A perennial that flowers from April to August. Usually self pollinated and seeds can be viable 10 days after flowering. 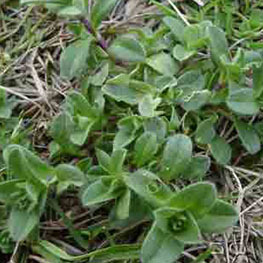 Has square stems with leaves that are similar to chickweed.